The embassy in Cairo has been closed sue to protests over a detained Egyptian human rights lawyer. SAUDI ARABIA TODAY closed its Cairo embassy and recalled its ambassador following protests over a detained Egyptian human rights lawyer. The unexpected escalation followed days of protests by hundreds of Egyptians outside the Saudi Embassy in Cairo and consulates in other cities to demand the release of Ahmed el-Gezawi. Relatives and human rights groups say he was detained for allegedly insulting the kingdom’s monarch. Saudi authorities denied that and said he was arrested for trying to smuggle anti-anxiety drugs into the oil-rich kingdom. It was the worst diplomatic tiff between the two regional powerhouses since Saudi Arabia and other Arab countries broke off diplomatic ties with Egypt after it signed a peace deal with Israel in 1979. Diplomatic relations were restored in 1987. El-Gezawi’s case has revived long-standing resentment over the treatment of Egyptians working in Saudi, which is a destination for more than a million Egyptians searching for better jobs. As Arab uprisings have toppled four longtime Middle Eastern rulers, Saudi Arabia has been worried about signs of rebellion within its borders. Authorities have met attempts to advocate for more rights, as el-Gezawi has done, or question the authority of the monarchy in any way with strong opposition. Many Egyptians suspect the drug case against el-Gezawi was forced to cover up his human rights work. Outside the Cairo embassy earlier this week, protesters chanted, “Down, down with Al-Saud!” referring to the Saudi royal family and “Screw you, your majesty!” in reference to King Abdullah, the aging Saudi monarch. The demonstrators called for the expulsion of the Saudi ambassador in Cairo, and some raised their shoes alongside a picture of Abdullah, a sign of deep contempt in the Arab world. Others climbed over the walls of the embassy in Cairo. In the consulate in the port city of Suez, protesters blocked staff from leaving Thursday, prompting the military to evacuate them. Egyptian protesters also were resentful of their government’s reaction to the case, raising questions about whether it does enough to protect its citizens. Many activists also claim Egypt curbs its criticism so as not to alienate the wealthy kingdom or endanger Egyptian jobs there. 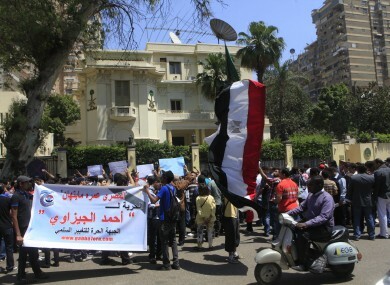 Egyptians also held rallies outside the Foreign Ministry in Cairo, demanding the Egyptian ambassador in Saudi Arabia be questioned over his handling of el-Gezawi’s case. The diplomatic dispute also underscored the inherent tensions in the region between Gulf Arab states and Egypt since the ouster of Hosni Mubarak last year in the face of popular protests. At one point, the Egyptian government said Arab donors have been reluctant to come up with promised money to help the local economy as it suffered following the uprising. Gulf nations, led by Saudi Arabia, remained publicly supportive of Mubarak even as Western allies called for him to step down. His downfall — and the swift policy shifts in Washington and elsewhere — deeply stunned the Gulf monarchs and sheiks who considered Western backing as an unshakable pillar for their regimes. In response, Gulf states have increasingly banded together to try to stamp out Arab Spring-inspired opposition and build independent strategies to control key regional rival Iran. Email “Saudi Arabia closes embassy in Egypt following protests”. Feedback on “Saudi Arabia closes embassy in Egypt following protests”.